When late November's rains, December's holidays, and January's recuperation have kept you penned up indoors, you just get to feeling you have to "bust a move" to the backcountry. Nine Harvey Broome Group members were obviously suffering from pretty bad cases of cabin fever, and great late winter weather provided strong encouragement for getting out, and throwing several tens of pounds of gear on their respective backs. Susie and I had not been on an official backpacking trip since last June, due to our Prince William Sound sea kayaking trip and my foot surgery. I figured it was going to be a shock to my system, but one that I had to get past. Our trip was to be one of the classic Smokies loop trips: Out of Elkmont up to Jakes Gap, slab around the side of Dripping Springs Mountain, and drop down into the cove that cradles Lynn Camp Prong for a night's sleep in Marks Cove. 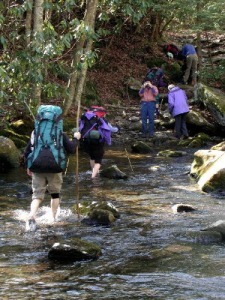 The next morning, we were to descend along Middle Prong, before a refreshing ford of the river, and climb back up to Jakes Gap. We had all gathered at Will's house, and had tried to figure out a complex permitting/car pooling arrangement, until Bob and BJ announced that they had to take a different route, so that they could get home sooner on Sunday. The rest of us headed for Elkmont via the "back way," to avoid the throngs of shoppers around the Pigeon Forge entrance to the park. To me, it has always been a mystery how some folks can want to spend more time in a mall in the shadow of the Smokies that in the mountains themselves. Probably just as well. The seven of us congregated at the entrance to the Elkmont campground, and then drove up past the old cabins to the trailhead. The cabins, which still have not been torn down, even though the leases expired some time ago, have represented a sore spot with many environmentalists over the years: how could a privileged few maintain a summer home inside a national park? Despite the long months of no backpack on my hips,Saturday's climb from Elkmont did not seem too bad. 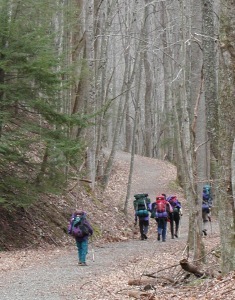 The trail is well graded and the walk provided a real treat. At an elevation of ca. 3750 feet, about 300 below Jakes Gap, Mother Nature had coated the trees in a thick rime, turning the high country into a frosted fairyland. OK, the climb seemed a bit tougher than it felt when I first had made the trip more than 23 years ago. 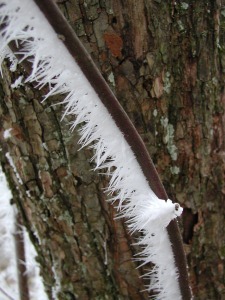 But everyone enjoyed the snowstorm resulting from the rime falling from the sun-warmed trees at the gap. While I had remembered the trip around Dripping Springs Mountain as a "slab" (hiking at relatively constant elevation), the topo map and my panting demonstrated otherwise. After a 600 foot climb, we were treated with a spectacular view at our lunch spot. The early morning clouds had yielded to the sun: we drank in a sweeping view from Thunderhead all the way to the east, past Clingman's Dome. Lunch in the warm sunshine tempered the thermometer reading in the high 30's. After lunch, the topo map threatened some additional climbing, but hiking verified another example of inaccurately mapped trails: There was no climbing, just flat, and then a gradual descent to the junction with the Lynn Camp Prong Trail. Our group of seven paused but briefly, and speculated on the time when our other party of two, Bob and BJ, would have reached camp. We covered the 2.4 miles to the floor of Marks Cove, and our campsite, in a little over one hour. The rest of the crew accused me of thinking more of a bath and dinner than a safe rate of descent down the trail. We arrived at lovely Marks Cove Campsite to be greeted by BJ and Bob, who reported that they had arrived nearly 2.5 hours earlier. Despite reports of a marginally attractive campsite by hiking guides, Mark's Cove remains one of our favorites. It is situated along an old railroad grade, which offers plenty of flat sites for tents, albeit free-standing ones: The gravel in the rail grade makes for some salty comments while attempting to plant tent stakes. Judging from the pile near the fire ring, Bob and BJ had wisely, we thought, spent their extra time gathering a lot of downed firewood. We noted that a small bottle of Amaretto outside their tent was likely to have fueled their efforts, or helped soothed their sore muscles after such arduous effort. I confessed to Susie that I had managed to slip into my pack an entire bottle of wine without her knowing. I could tell that she was not protesting very much. After setting up camp, and taking a rather frosty bath at the edge of a side stream, it was time to start thinking about dinner. OK, I had been thinking about it earlier, but now, it was time to get serious. With the right mix of participants, the evening meal on a backpack can be more of a dinner party in the woods, rather than merely the utilitarian act of consuming calories to fuel the next day's journey. This night, the guest list was incomparable, and the conversation scintillating. We started the campfire early, as you could just feel the mercury falling out of the bottom of the thermometer. The evening was clear, the moon was out, with a host of stars for company, and the temperature was headed for the low 20's. It was cold enough so that the butane lantern we had brought would not light (the mix of propane and butane in these things just will not volatilize with any efficiency at low elevations at temperatures much below 32 degrees), so I put it over near the fire. Will, who, as a physical scientist, makes a great attorney, immediately expressed concern about my blowing myself and half the group up if the gas cylinder exploded. I tried to explain that I was just slightly warming it, but the laughter and guffawing gradually degraded to the point where there was talk about my being in the running for the next set of Darwin awards, should I be wrong. Iit all seemed in good fun. The party wound down about 9 pm, as the day's fatigue worked its way into our consciousness. We all repaired to our respective nylon castles, to await the morning's warming sunshine. To be sure, the morning could have used more warming sun, for the thermometer struggled to break 20 degrees. We restarted the fire, and thawed frozen water bags in the creek, preparing for the day's hike. Susie and I used our Bakepacker to make some muffins, and that took a very long time. Bob and BJ left early, heading back down to Tremont, in an attempt to honor a previously scheduled appointment for early Sunday afternoon. The rest of the crew seemed to take a pretty leisurely approach to packing up, seemingly stalling for the sun to finally strike camp. Nevertheless, Susie was starting to express apprehension that we were going to be left behind. But by 9:30, most of us were on the move, with she and I about 5 minutes behind. Ray lead the early departers to a "hidden" waterfall, which is off-trail just downstream of the junction of the Greenbrier Ridge and Lynn Camp Prong trails. From that point, it was a 40 minute walk down to the day's first challenge: a ford of the Middle Prong of the Little River. Several of the party felt pretty good about rock hopping huge boulders to avoid putting their toes in the frigid water. The rest of us opted for the safer and more refreshing approach: slapping on a pair of Tevas and plunging into the water. It was mid-calf deep at the most, which doesn't sound too bad, until one considers the temperature. Even Susie, who had been dreading the crossing for a week, admitted under close questioning that it was not as bad as she had feared, and that circulation would likely return in the next few hours. Actually, we warmed up pretty quickly with the climb. Indeed, the climb up the Panther Creek trail would take every bit of 100 minutes, and many of us exclaimed that our age could not be the problem. It just seemed that the trail had gotten steeper in recent years. About halfway up the climb, we stopped for a rest near a crossing of Panther Creek. Ron and Will looked at their topo maps, trying to figure out where we were, since our crossing of the creek was pretty definitive, or so it seemed. 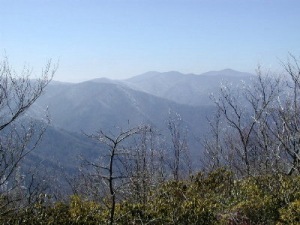 Ron reported that if the trail went as it was shown on the map, we had a very long way to go to get to Jakes Gap. So I pulled out my GPS, and got a reading. The coordinates I got fit perfectly with the "ground truth." That is, the stream was in the right place, and the valley went as expected. The only problem was that we were not on the trail. Like, no where near it. If you click here, you can see a comparison of the trail position shown all all commercial maps and the route I think we took. Interestingly, if you look closely on the topo map, you may see a second trail coming down from Jakes gap, but disappearing in the word "Panther." The trails are not linked, and I just think this is a good example of why you have to be careful when relying on human marked objects (like trails) on topo maps. It can turn out that they are mapped incorrectly. As Susie and I pulled into the Jakes Gap, the ones who had arrived earlier were already relaxing in the muted sunlight, remarking about how different a place it had seemed just 26 hours ago: no artificial blizzard now, just warm sun. After lunch, it was time to head back down the trail to Elkmont, and the conversation shifted from backcountry tales to the respective status of our 401K plans. It was clear that we were about to return to the real world, and all its esoteric pressures. Many of us vowed that we would not wait so long the next time to take an old fashioned Smokies backpack.